4th of July Fireworks in So. Md. Please email your updates/additions to support -at- somd.com. using the provided web sites or telephone numbers before departing for the event. Police will be out in force over the long weekend looking for DUI drivers. Be safe! Use a designated driver. We'd prefer not to publish your name on somd.com in the DUI arrest reports. Start the 4th of July celebrations early and join us at Veterans Memorial Park for the Town of Chesapeake Beach's first concert, in the Summer Concert series, hosted by the Town's Economic Development Committee on Saturday June 30th at 3:30 pm. Presenting the Six-String Soldiers — one of The United States Army Field Band's most versatile ensembles, Six-String Soldiers will be performing Americana, folk, bluegrass, and Irish music. The Town's fireworks display will start at dusk on Saturday June 30th. Town of Chesapeake Beach Web site. Come aboard for the best view in town! Bring a picnic basket, if you like, with your favorite food and libations. Rain date is Thursday, July 5; no refunds unless the fireworks are canceled on this date as well. Registration required by June 30. Calvert Marine Museum Web site. Wednesday, July 4, 2018 @ Between 9:15 and 9:30 p.m. The Solomons Business Association proudly sponsors the annual Solomons Independence Day fireworks display. Fireworks will be shot from a barge in the Patuxent River and can be viewed from the Riverwalk. Celebrate our nation's birth and show your colors all day long! The Fireworks will be preceded by activities throughout Solomons, sponsored by individuals and businesses. The Solomons fireworks display will be shot from a barge in the Patuxent River and can be viewed from the Riverwalk. Vehicular traffic on the island will be restricted, and parking will be directed to designated areas only. Parking at Glascock Field and there is a fee (not specified, but was $10 per car in 2016) with proceeds to support the SBA Fireworks and Boy Scout Troop 451. Police also remind people that Myrtle Point Park, in St. Mary's Co., is not to be used as a viewing area for the Solomons Island Fireworks due to the park being closed. Friday, June 29, 2018; The Greens opens at 5:00 p.m. and the concert begins at 7:00 p.m.
Leonard Bernstein 100 Birthday. Anniversary Music of Bernstein, Tchaikovsky, Sousa, others. 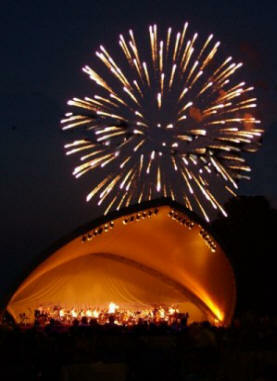 The Chesapeake Orchestra performs & FIREWORKS! River Concert Series website. Come out and join us for our Annual Independence Day Celebration. This event is put on by the Members of the Hollywood VFD as a way of giving back and saying thank you to the community that supports us year after year. The fireworks display is one of the Largest in the area and we also provide a free concert before the show. Also, we have the carnival set up including games and food with $5 Armbands to ride all night. Please stop by and have a great time at this family friendly event. FIREWORKS DISPLAY AT DUSK. Hollywood VFD website. Wednesday, July 4, 2018 @ Dusk; Gates open at 3 p.m.; Live Music 5-9 p.m. The Charles County Fair Board will be presenting a new and improved Fourth of July Fireworks demonstration (brought to you by Innovative Pyrotechnic Concepts, LLC) this year, a show that has never been seen or heard in the county before last year. Enjoy a memorable Independence Day with family and friends at the 2017 Celebrate Charles: A Fun-Filled Fourth on Tuesday, July 4 at Blue Crabs Stadium (11765 St. Linus Drive, Waldorf) from 4:30 p.m. to 9:30 p.m.
• Enjoy delicious local food and drink from Calvert Kettle Corn, Mike's Chicken & Ribs, Dooley's Backyard BBQ, Tasty Creations, Mike's BBQ & Catering, Circus Ice Cream, Kona Ice, Wee Bee Coffee, GROD Jerk Ribs & BBQ, Love's Tasty Chicken, Softee Swerve, Smokers Delight BBQ, and more! • Additional parking available at St. Charles High School. Free admission to outdoor activities. A ticket is required to enter the Blue Crabs Stadium for the Southern Maryland Blue Crabs game. Fees for food purchases. For more information, call 1-800-766-3386. Citizens with special needs may contact the Maryland Relay Service at 711, or Relay Service TDD: 800-735-2258. Note: Event website says event will take place rain or shine, but may be best to double-check the site if it is raining that day just to be sure. 9:10pm - Spectacular Fireworks Display!! Limited general parking around the Village Green. Handicapped parking available in the Village Green Lot. Ticket booth closes promptly at 7:15pm but remains open for emergencies/lost & found only. Amusements open 4pm - 8pm weather permitting. Wristbands $10/endless rides & tickets sold. Reduced rate ride wristbands for Town residents & military residents - must be purchased in advance at the Town Hall, available June 11th to June 29th, proof of residency or military ID required. Reduced rate wristbands are NOT available at the July 4th event. NO ride wristband or ticket refunds for inclement weather or after ticket booth & amusements are closed. NO PETS OF ANY KIND OR ALCOHOLIC BEVERAGES PERMITTED! For more information call 240-375-4061 or E-Mail karen@townofindianhead.org or visit the event page. Town of Indian Head Web site. Join us for hot dogs, games, wet fun, and plenty of watermelon! Free hot dogs, watermelon, & ice cream 10:30 a.m. to 1:30 p.m. or while they last. Event is wheelchair accessible. Visit the Event Page or Town of La Plata Web site. Please note that this page is for Fireworks displays only. There are many more events scheduled for the tri-county area. You can find these listed in the Community Calendar.